"Wonderful side dish to have at your family cookouts! Quick and easy, and the flavors really transform your garden cucumbers. You can also add grape or cherry tomatoes for enhancement. Keep in the refrigerator until ready to serve." Arrange cucumber slices in a large bowl, generously seasoning each layer of cucumber with salt and pepper. Cover bowl with plastic wrap and refrigerate for 3 hours. Drain liquid from cucumbers. Gently press cucumber slices with paper towel to absorb any remaining liquid. Stir half-and-half, sour cream, mayonnaise, green onions, ranch dressing mix, sugar, dill, celery salt, and lime juice together in a small bowl; pour over cucumber slices and gently stir to coat. 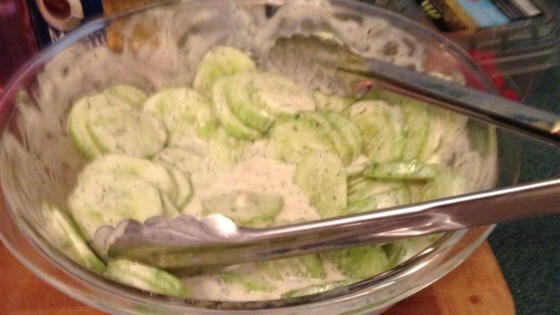 Yes I only used 3 English cucumbers and half of the cucumber dressing . It went great with steak and tuna pasta salad too . Yummy!